Time is short again for me this week but we had a big turnaround within the Top 5 as three of the five teams ranked there last week lost. But UCF keeps winning and are really the undisputed top Group of Five team. 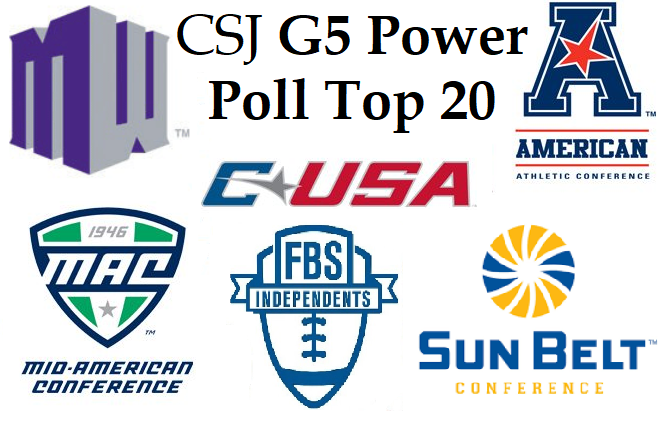 Fresno State, Army West Point, Houston, and Utah State round out the Top 5 this week. Buffalo (who already won this week) moves up to #6. Georgia Southern, who defeated prior #3 Appalachian State last week moved up to #7. South Florida moves down from #2 to #8 following its loss to Houston. Boise State and Cincinnati round out the Top 10. Northern Illinois and Troy enter this week’s Top 20, while BYU and Western Michigan move out. 14 15 Marshall 5-2, 2-1 CUSA Bye at Southern Miss.